I finished up my stacked coins quilt the other day all in one evening after work - basted, quilted and bound. I was pretty excited that I was able to get it done in time to link up to 100 Quilts for Kids over at Swim, Bike, Quilt. Since this charity quilt drive is being hosted by the DC Modern Quilt Guild, which is was my guild before I moved, I really wanted to participate - and it seemed like a great way to get back into the quilting groove after moving. Once I got the top done at Sewing Summit (with lots of help from Natalie! ), I figured I should try to finish it up in time. It was also a great chance to practice my free motion quilting, which was fresh in my mind after the class I took at Sewing Summit. I had fun playing around with this loopy pattern, it was easier for me than stippling since I didn't have to worry about quilting myself into a corner. I definitely need to work on keeping my pattern at a larger scale, though - I was working pretty small and it took a while to do it. For the binding, I decided to try doing it entirely by machine, which I have done on smaller projects before but never on a whole quilt - partly because it would be faster, and partly because I figured it would be more durable for this quilt which will hopefully get lots of use! It actually turned out better than I expected, and I would definitely do it again. One thing that I found helped was that I quickly basted the mitered corners before I sewed the binding down the final time - that helped to keep them more neat and even. 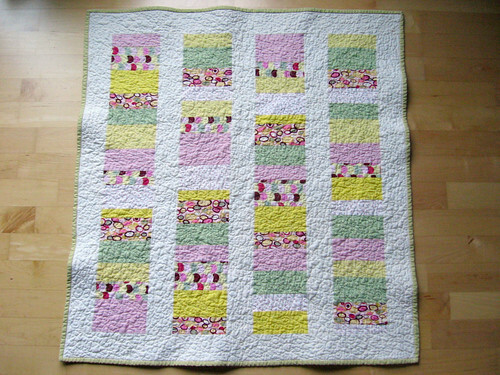 I'm donating this quilt to a group at my mother's church which gives baby items to mothers in need. I hope that it brings joy and love to the baby that receives it! I can't believe you did all that in one night!! Well done ;) The quilt looks gorgeous and I'm sure someone will love it. I will use your tips about basting the corners, I machine my binding but can never get the corners quite right so thanks! I love it!! Plus, the quilting looks great. I love to FMQ the baby quilts because it's so manageable and goes so fast. This was such a good idea for a little quilt! 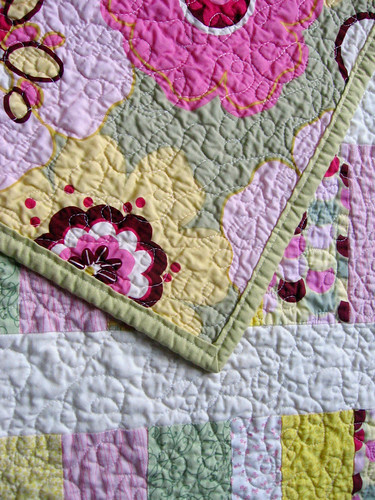 Darling - and I love your quilting - I need to try that loopiness!